Bhubaneswar (PTI) International Yoga Day was enthusiastically observed across Odisha today, with Union Ministers Dharmendra Pradhan and Jual Oram leading programmes at Bhubaneswar and Sundargarh respectively. 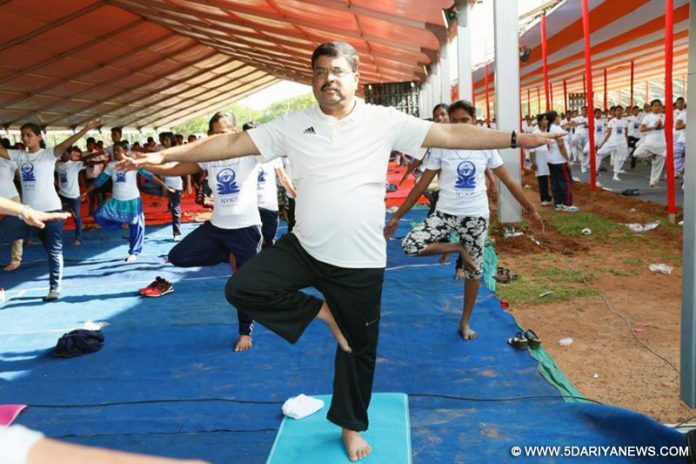 In the state capital, Union Petroleum Minister Dharmendra Pradhan attended a yoga camp at Janata Maidan where a large number of people from different spheres of society assembled for the session. Nehru Yuva Kendra Society (NYKS) and NCC took part actively in the initiative on the day for which the theme this year is Yoga for Health. Instructors of various Yoga institutes imparted yoga training. Highlighting the benefits of the exercise, Pradhan said people should perform yoga regularly in order to keep themselves physically and mentally fit. Besides India, International Yoga Day is being observed in a large number of countries as yoga has been recognised as a means to maintain good health, he said. Union Tribal Affairs Minister Jual Oram, who joined a yoga event in Sundargarh district, said due to the efforts of Prime Minister Narendra Modi, yoga has attained recognition across the globe. A state level function was held at Jaydev Bhavan in the state capital at the initiative of Ayush directorate.State health and family welfare minister Pratap Jena highlighted the role of yoga in keeping people mentally and physically healthy and stress-free. A number of yoga camps were organised throughout the state where people belonging to different sections of society, including school students, leaders and distinguished personalities took part in the yoga sessions. The day was also observed in different educational institutions and industrial units across the state. In the seaside pilgrim town of Puri, internationally acclaimed sand artist Sudarsan Pattnaik created a beautiful sand sculpture depicting Prime Minister Narendra Modi sitting in the ‘Padmasana’ posture. Pattnaik said his sculpture aims at spreading the message of peace and harmony through Yoga. Pattnaik said his sculpture aims at spreading the message of peace and harmony through Yoga. with Union Ministers Dharmendra Pradhan and Jual Oram leading programmes at Bhubaneswar and Sundargarh respectively.